You will experience powerful and inspiring singing from our choir, a practical message that is biblical and relatable to your life, and dynamic worship from our worship team. We also have family photo areas for you to take that perfect Easter Sunday picture. 9202 Philadelphia Rd. Rosedale, MD 21237. Our church is located on Philadelphia Rd. between Rossville, Blvd and King Ave. Your kids will have a blast hearing the Easter story in a fun and interactive way! Kids' Easter Celebration takes place at the same time as the Easter services. Children K3-K5 will have fun listening to a fun Bible story, and playing fun games in a clean and safe environment. Children 1st-6th grade will enjoy games, music, skits, and an exciting Bible story about the true meaning of Easter! Save time by pre-registering your children online. You will be able to skip the line and get right to all the fun when you arrive. We are expecting larger crowds on Easter so we encourage you to arrive at least 15 minutes prior to the service start time. Parking attendants will direct you to an available parking space. Please wear whatever you feel comfortable wearing. There is no right or wrong way to dress, we're just glad you came! We will have live music, a message from our Senior Pastor, and other media elements. The entire service will last about 70 minutes. If you have any questions please contact Pastor Steven Miller who is our Easter Sunday Coordinator. His direct number is 410-404-9133. 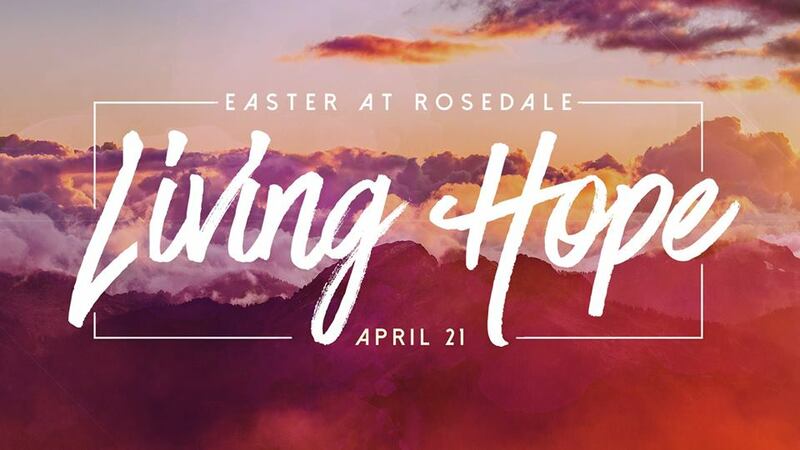 We look forward to celebrating Easter with you and your family at Rosedale on April 21st.